Meet Arianna ‘Ari’ for short! She is a 3-year-old, 53-pound Blue Pit Bull who proudly wears a smile! Her coat is so rich in color when she races like the wind, people may think she is a greyhound. Ari is sweet, strong, and a little shy at first. Shelter volunteers say she has great leash manners and is very smart. She can be somewhat reactive to other dogs and would do best in a home where she will be your one and only. Because she is strong, children in the home should be older, kind, and dog-savvy. 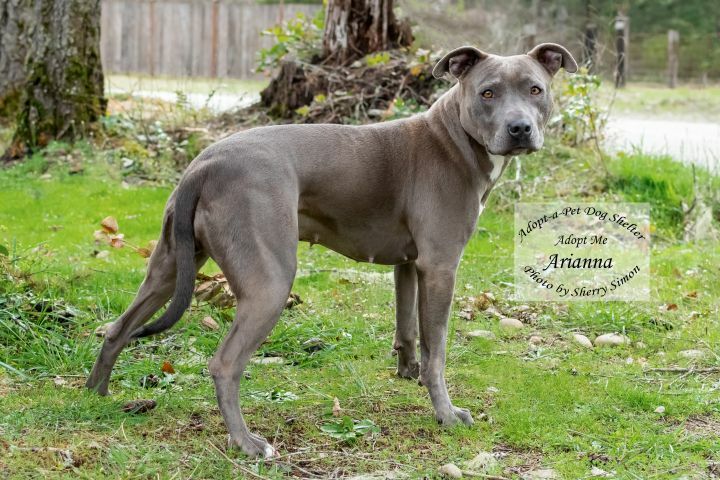 If you can provide Ari with a fenced yard to keep her safe, and plenty of love and exercise to keep her healthy and happy, she may be the perfect companion for your family! If you have further questions or would like to schedule an appointment to meet Ari in person, please contact the adoption team at Shelton Adopt-a-Pet. Emails are the preferred method of communication.